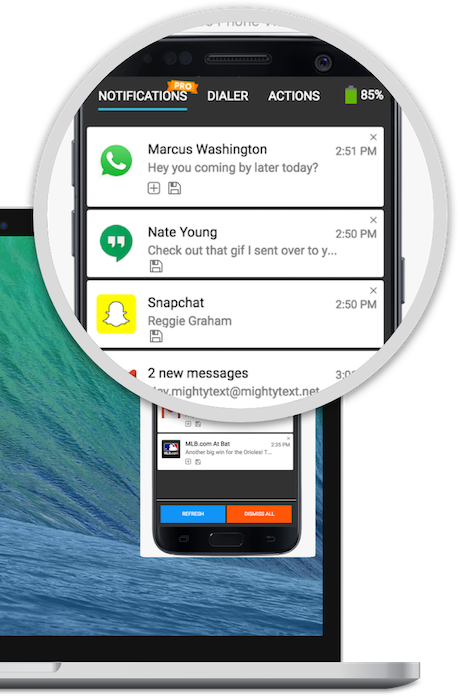 With Phone Notification Syncing you can view, manage, and dismiss your phone's notifications directly from your computer. On your computer, you can see all of your phone's current notifications in real-time, and dismiss or save them directly from your computer. All of the notifications currently on your phone will show and the notification list will update on your computer in real-time as notifications come in on your phone. If you want to keep this view open, Live View can be opened in its own standalone window. In the MightyText Web App, go to Phone > App Notifications. In the MightyText Chrome Extension, click the M icon in the Chrome toolbar and select Live Phone View. 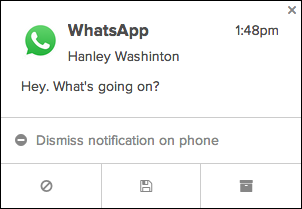 In the MightyText Desktop App, select Live Phone Notifications from the MightyText icon in the dropdown menu. Note: Live Phone Notifications is a MightyText Pro feature. Non Pro users can try out Live Phone Notifications a few times per day to check it out. From here, you can dismiss the notification or save the notification content for future reference. You can also block all future notifications from this app or save all future notifications from this app directly in the alert rendered on your computer. Phone Notification Syncing requires Android OS v4.3+ and needs to be enabled on your phone. Follow these steps to set up Phone Notification Syncing on your phone.